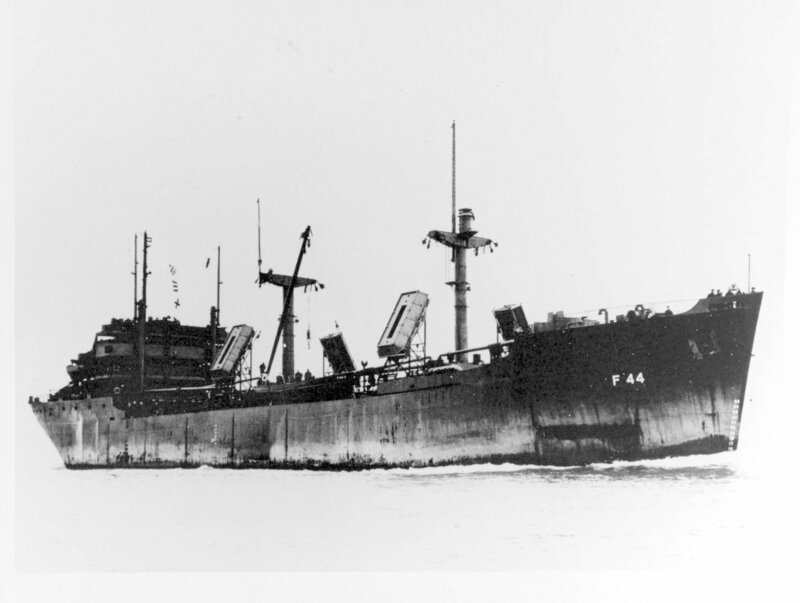 Laid down, 23 October 1944, as MV Wall and Crown a Maritime Commission type (R1-M-AV3) hull under Maritime Commission contract (MC hull 2206) at Pennsylvania Shipyards, Inc, Beaumont, TX. Decommissioned, 18 June 1946, at San Francisco, CA. Placed out of service, 2 December 1969 and turned over to the Maritime Administration for lay up in the National Defense Reserve Fleet, Suisun Bay, Benecia, CA. Final Disposition, broken up for scrapping, 14 June 1973, to China Dismantled Vessel Trading Corp., for scrapping in Taiwan, delivered, 10 July 1973. 112k USS Laurentia (AF-44) under way circa 1944-45, location unknown.